Start by taking the waxy wrapper off the fresh tomatillos. Your fingers are going to get sticky so maybe have a damp paper towel next to you to quickly unstick your fingers while peeling. After your tomatillos are peeled and washed add them to a large sauce pot. Also, add quartered yellow onion and garlic cloves. Add water to the sauce pan, just enough to cover the tomatillos. Place the pan over medium heat and bring to a boil. Boil the tomatillo mixture until the tomatillos turn more of an olive color vs a bright green. Normally 10-15 minutes. I then add two seeded chipotle peppers to the boiling water, and boil that for another 5 minutes. Now that everything is nice and soft grab your food processor. If you don't have a food processor a blender will work just fine. Spoon out all the ingredients into the food processor, but save the water because you will need that to thin out the salsa later. Once all the ingredients are in the food processor start pulsing the ingredients. This is where I add a couple heavy pinches of salt to the salsa. If you don't salt it, the tomatillos almost make it taste sour. Salt helps balance out the sour taste. Give it a couple more pulses and taste. If the spice level is where you like it, then leave it. I normally add 1-2 more seeded chipotle peppers. I really like the smoky taste they bring to the salsa. Also, if it still tastes sour give it a couple more heavy pinches of salt. ***TIP: when making salsa the flavors change with every new batch. You just have to taste as you go. So, if the salsa still tastes a little sour keep adding a little more salt; even if it is more than what the recipe calls for. Or if you want more heat add another chipotle pepper. This is the beauty of cooking you can make it your own!! As of now you are probably thinking the salsa looks a little thick. Add about 1/4-1/2 cup of the water we used prior too when boiling the tomatillos. This will help thin out the salsa a little. ***TIP: again this will vary because the juiciness of tomatillos vary per batch. Add as little or as much as you see fit, I'm just giving a ruff guideline. There you have it, homemade smoky tomatillo salsa (AKA my copycat version of Fresco Mexican's version of their green salsa). See my recipe note for further information about this restaurant. ***TIP: they sell "love chips" tortilla chips shaped in hearts. They also come in different flavors that you can order online! Y'all when I moved to New Jersey from Kansas I would have killed for good Mexican food! No I'm not over reacting, I'm dead serious. We live next to NYC and I couldn't find a true authentic Mexican restaurant. Yes, they have gourmet Mexican; but I wanted authentic Mexican that tastes like one of my friends grandmothers made it from back home. So, long story short. Tanner and I moved to a town called Chester, NJ and I finally found "real" Mexican food at a restaurant called Fresco Mexican. When I say we eat there weekly might be an understatement. If you are in the area give it a try. 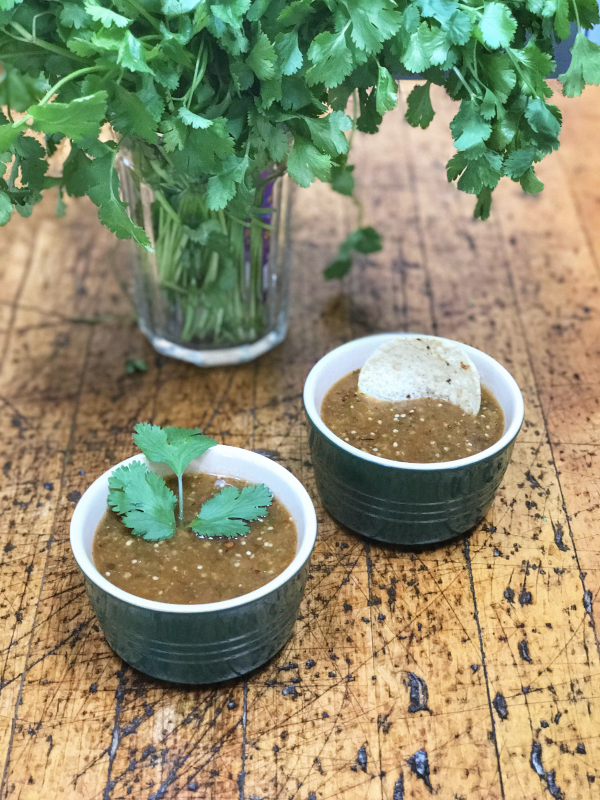 This recipe my copycat version of their green salsa. I could literally drink the stuff. Like I said give it a try and let me know what you think. I'll put their restaurant link below! Enjoy!! !